​With the beginning of the college basketball season come all the hot takes about which ​programs will dominate the landscape. 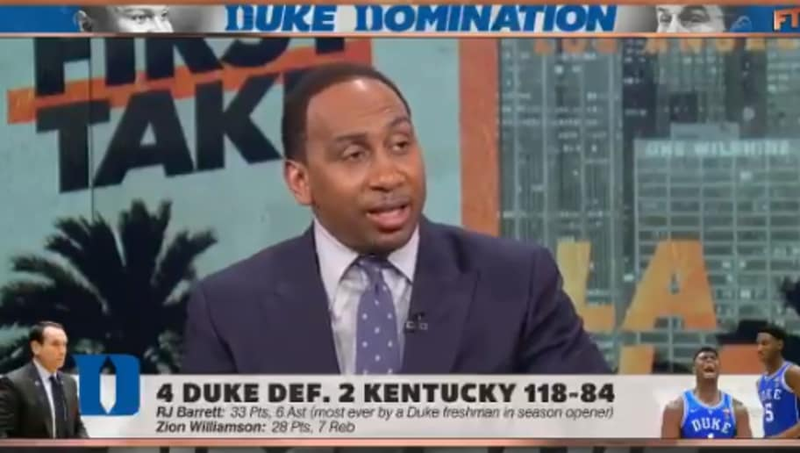 Stephen A. Smith is the latest to join in, saying they may be good enough to go undefeated wire-to-wire. But he also mistakenly thinks they're playing Kansas tonight for some reason. So take that with a grain of salt. ​​According to Smith, Duke was ​so good last night that they'll be 2-0 at the end of the day despite the fact they don't play again until Sunday. However, based on their performance last night, there's no reason to believe Duke wouldn't have beaten Kansas if they played tonight. It's just that they aren't. ​That's not how it works, Stephen. Duke's freshmen outscored the No. 2 team in the country. ​​It's worth remembering that it's only been one game. Duke could be as good as they were on opening night, or they could've just had a really good flow going that they won't always be able to match. They shouldn't be getting declared one of the best teams in college basketball history after just one game. A lot can happen over the course of the season. But don't let that get in the way of the hot takes, folks.